After having success in the first quad meet of the season, the team knew that they would need the same kind of team effort in the second quad hosted by Deerfield. The Giants once again executed their race plan wonderfully. Senior Ben Casey and junior Brett Davidson moved right to the front and, along with one runner from GBN, started to pull away after the mile. The GBN runner stayed in striking distance of Davidson through the two mile as Casey had increased his lead on the field. In the end Casey and Davidson took first and second (15:10 and 15:23) as the GBN runner finished in 15:35. Sophomore Jonathan Rosenfeld came into this race with the goal of breaking up GBN's top three and staying ahead of Deerfield's top runner. He got into great position and was able to catch up to GBN's number two runner as they battled each other throughout the final mile. Down the last stretch they were stride for stride as they were flying to the finish. The GBN runner (state qualifier in the 800 Meter Run) was able to get a step on Rosenfeld (15:44) and hold him off. This was another strong showing by Rosenfeld, who continues to show how tough of a racer he is. 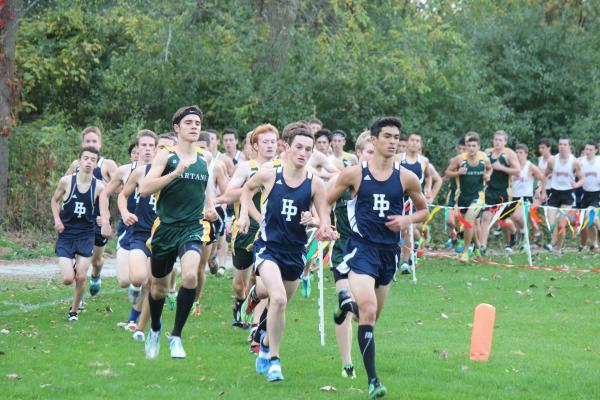 The next pack included Deefield's top three and GBN's number three runner, but not far behind them was an HP pack. Senior Andrew Huddleston battled back at the end of the race to lead the pack in and take 10th (16:06). He was followed closely by senior Eddie Herz (16:09) and freshmen Fitz Laurie (16:10). If this pack can continue to move up and close the gap on Rosenfeld, it will put us in the hunt for a chance to qualify for state. 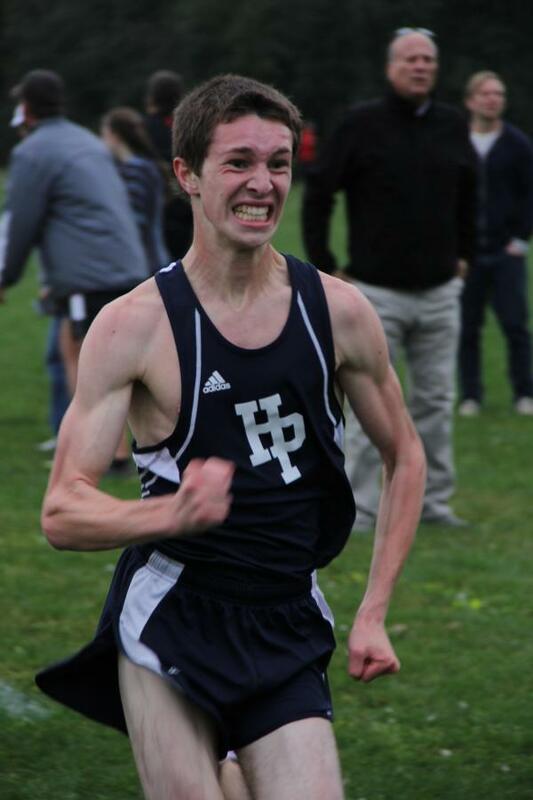 Freshmen Nate Amster was the next HP finisher as he was in 17th at 16:32. He was within 8 seconds of the 5th runners for both DF and GBN. After Amster, seniors Kevin Merkel and Dylan Kahn had strong races and are looking to continue to move up and help the team. They finished in 19th and 20th (16:46 and 16:46.4) as they worked well together throughout the race. The next several finishers for the team have been continuing to chase our top seven and help make us a better team. We had seven more runners that finished under 17:30. Most of them are team members that will be returning next year with a chance to be in the top seven if they keep working hard and bring their training (especially offseason) to a new level. Sophomore Matthew Casey (16:57), juniors Joe Pinsky (17:00) and Daniel Arias (17:09.4), sophomores Josh Drummond (17:09.8) and Charlie Skurie (17:12), junior Alejandro Gutierrez (17:25), and senior Jay Levin (who had a breakthrough race, 17:28). The team beat all three schools by scores of HP 21-DF 36, HP 23-GBN 34, and we beat Maine East as they did not have a full team racing varsity. This gives Highland Park 7 straight Quad Meet sweeps which is equivalent of 21 straight duel meet victories over the past few years! Now the focus is on progressing the training to prepare for the CSL meet and State Series. Everyone on the team knows that it is crucial that they take care of themselves by doing all of the right things. This includes taking care of their responsibilities in the classroom and staying healthy. They must take care of all of the details! In the frosh-soph race, Highland Park had five freshmen competing. They represented the Giants well and all had strong races. They were led by Alex Frank who made some adjustments to his race plan that helped him have a more complete race finishing in 4th place for the 2.25 mile race in 12:44.2. He was followed by Alec Glazier who took 8th in 13:01.8 as he has been battling some injuries. Once he is able to get healthy and get in consistent training as a distance runner he will have great success. Danny Friedman and Sam Flaberg worked together through a good portion of their race as they both did well and took 18th and 21st in 13:48.8 and 14:05.5. Finally, in his first race of the season, Ben Sipowicz ran very well and took 33rd in 14:35.4.